Adult life is full of mysteries. What should you check before renting a flat? How do you ask for a pay rise? Does anything really need to be dry cleaned? And why does everyone else seem to know these things except you? Being an Adult is a practical and entertaining guide to the life skills you didn't learn at school, from when to ask for a discount or send a condolence card, to how to save money, and what you need to know before your first day at work. 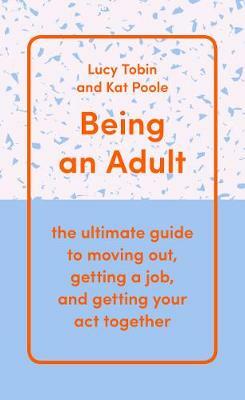 If you've ever wondered when you're going to become a `real' grown-up, this book - with top tips from 20- and 30-somethings, and proper adults including a plumber, a doctor, and a personal finance expert - will give you the answers you need. Lucy Tobin is an award-winning journalist, specialising in business and personal finance at the Evening Standard. She's also a regular in magazines and online media including Cosmopolitan, Marie Claire, and the Huffington Post, writing on topics ranging from student life and uni to careers and parenting. Recently named Business Journalist of the Year at the Santander Media Awards, Lucy is the author of six books, including the Amazon-bestsellers A Guide to Uni Life and Entrepreneur. She can often be seen and heard on commenting on news stories on TV (BBC Breakfast, News 24, Sky News) and radio (Radio 4's Broadcasting House and Woman's Hour, LBC). Lucy graduated from Oxford University with a first-class degree in English in 2008. Kat Poole is editor of Emerald Street, the daily women's lifestyle email magazine from Shortlist Media. She started her career at Stylist magazine, and has written for Empire, The Debrief, and Red, specialising in lifestyle, culture, and entertainment. Kat graduated from the University of Warwick with a first-class degree in Film and Literature in 2011.